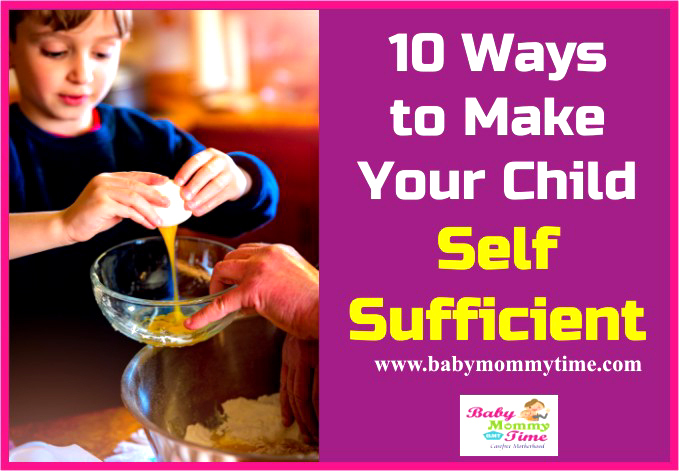 10 Ways to Make Your Child Self Sufficient - Babymommytime - Top Blogs on Baby Care, Parenting Tips & Advice. Self sufficient Child means to make your Child Strong, Independent, Confident, and Loving Person. For Parents, it’s important to focus on Child Personality at a Right Age, so that Kids move into his Adulthood, as a Good Person. Parents need to boost their Kids Self Esteem & Self Confidence; by doing this you’re actually making him an Independent Child. I Know, It’s going to be a tough task for Parents, but there is nothing impossible in the world. While dealing with your Child, it’s important for you to watch your behaviour and language. Sometimes, as a Parent, it’s difficult to hold your frustration and anger and especially when every day you’re hearing the irrigating dialogues from your Child. Dialogues like ‘Mom, I can’t find my school bag’, Mom, where are my books and school dress’ and ‘Mom, where is my football’, etc. Therefore, it’s important to make your Child Self sufficient Person, so that you do not have to hear this every day in your life. Biggest Parenting Mistakes would be not allowing your Child doing regular Household Chores. We, all love are Kids, and due to which we become an over protecting and caring parents. By involving them in daily household work, you’re actually making them realize the efforts take behind keeping the house clean. You can also assign chores that involve sorting or categorizing. You just need to tell them do 2 or 3 Household Chores like making their own bed, organising their school bag and cleaning the room after playing time. In starting, these few things will help them in developing the habit and later automatically, it will get into their daily routine. When we talk about making our child’s as an organized person, we wanted them to balance many tasks at the time, and that also efficiently. First of all, don’t argue or order, your child to organize the things. Before teaching him anything, you should get yourself involved with your child and make him understand the value of organizing things. Now the question is, how to make him an Organized Person. You can start with, telling him to organize the School Bags and Dress in the night one day before, tell them to put their education & drawing books in one place. You can also buy them storage boxes, where they can put their things inside the box and place it inside their wardrobe or somewhere in their room. These storage boxes, can be a great help for you to make him an Organized Person. Involving your child in buying stuff, can be a great idea to make them self sufficient. And, it will not take your much effort to make them self sufficient and self reliant. Take your child with you when you do Grocery & vegetables Shopping. Give them money to hand over to Shopkeeper and also tell him to negotiate with him. These small and small things, will help in building the confidence in your child. While doing the shopping, make your child aware of different categories of products and brand. This will make him aware of the process of buying and selling things. It will not be easy for parents, to teach the importance of Money to little champs. When you buy toys, clothes and other products for your child, keep telling him the price tag, and also the importance of it. Generally, we buy everything for our Kids, before they ask and sometime when they demand for something, we have never opposed it and, we all do this. There is nothing harm in buying things for your child, but sometimes you should not buy toys or other things, which is of no use and due to your child demand, you are buying it. Our Child, will not take much time to understand that, he can get anything he wants. Therefore, play smart with your child brain and keep telling him the price tag of every product you bring for him. Tell him how much effort and handwork, it takes to earn the money. Tell him to spend the money smartly, it will somewhere in the back of their mind will always remembered. When you ask, any parent, how your child should be ‘ the answer would be a responsible one’. But, does your work or make efforts to make your child a responsible one, the answer would be ‘NO’. We all want our child to be a responsible person, but it has been seen that parents give more emphasis on children’s studies, rather than that making them a responsible child. Do you know that Responsibility is a key to your child successful career later in life, therefore, please work on this part too. Encouragement is something, which can make your Child a very successful person. It’s not important that you only encourage your child, for the things which you have chosen for him and you like it. Let your child explore many fields, and encourage him to take up the same with full confidence. Parents need to understand that every child can’t be an engineer, doctor, pilot, lawyer or businessman . May be your child is good in acting, sports, dram or music.Kindly, let him choose whatever is right for him, as a parent your duty is to guide him in a right direction and encouragement can play an important role in this. Many parents, does not understand the time management importance. But, do you know that parents should teach the time management to their kids, when they were actually toddlers. Time Management is something which will make them confident and successful person. Person who respect time, time respect him back. Time will help your child in achieving what where he wants and it will remain with him throughout his life. It’s very easy to teach them time management, you can ask them to complete the work within the limited time, set the time for bed and dinner, tell him to come back from friends house within the time who have given him. 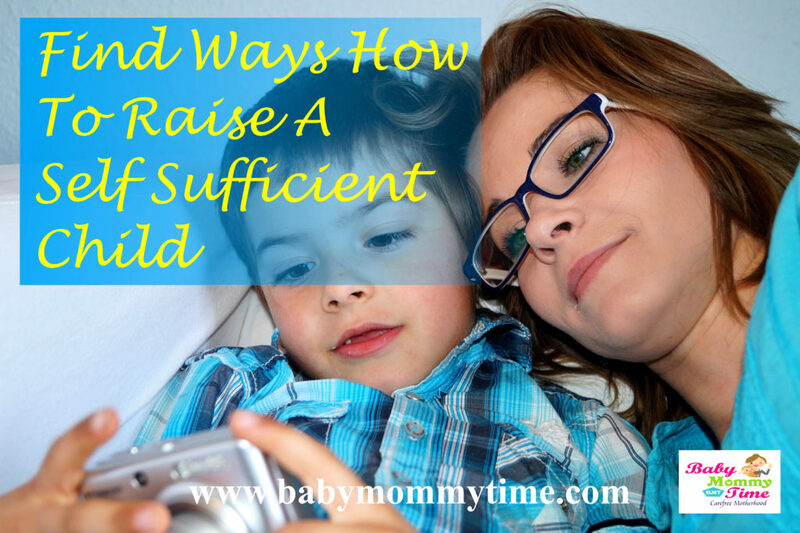 These could be the few ways, you can start teaching your child a time management. Encourage your kids, to participate in school activities, from the Pre School. Motivate him to participate in stage performance like dance, songs and singing. Plus this will help your child to over come the anxiety at the early stage and develop self-confidence. You must have notice that kids, who are very confident in their nature, are of capable of solving the issues by themselves. Therefore, it’s improtant to make them Self Sufficient at right age. Many parents force their views and opinion on their Child’s Life and except their kids to follow the same. By doing this, you’re actually demotivating your child inner strength and thoughts. Just build the confidence in your child that whatever is thinking and doing, could be a right decision and as a parent you trust his opinion and views. Allow him taking his own decision, does not mean that parents give them liberty to doing wrong things. By saying, motivate him to take his own decision means to build self-esteem and self-confidence. Self Confidence will teach your child to trust his own ability. Self Confidence will help them to overcome any problem later in his life, without making any major efforts. This will help him to fight any competition coming to his way and also give your child to live his life as per his own wish. Self Confidence will make him Self Sufficient Child. Do subscribe for getting latest updates.